I am a sports girl. I grew up watching football, baseball , soccer and hockey, with Olympic sports tossed in every few years. I will admit that basketball bores me stupid, and tennis and golf don’t even keep me awake with the aide of Mountain Dew, but there aren’t too many others. I used to love to play sports, but now that I am relegated to the role of spectator, I prefer of course, to watch through a lens while capturing the action when I can. For things like December football games, nothing beats curling up on my bed with a soft blanket, some snacks, and my Steelers rocking the house. My kids started sports early. I wanted them to have the benefits of the social interaction, the healthy lifestyle, and the fun. But I also wanted them to understand teamwork and to learn how to function as part of a team, and so we kind of adopted a team attitude towards our home life as well. We function as a team in many ways, and I find that the payoff is well worth the effort. While the idea of an “allowance” is cool with me from a parental perspective, it doesn’t apply to the “usual stuff.” Help me clean out the gardens before I set in fall bulbs? I’ll toss in some cash. Do the dishes after dinner? Guess what? You live here. That’s part of the team. So each kid has a “Chef Night” where they are responsible for prepping dinner for the family and then cleaning up after it as well. Haul boxes down from the attic and back up there? Money can change hands. But cleaning your bathroom? Sorry, dude. You live here, you clean up after yourself. And so it goes. The team approach is used with extra-curriculars as well. If one person has a game/match/feis/tournament, we all go in support. Siblings have wrapped up in layers of blankets on snowy sidelines for soccer games, they’ve been jostled through crowds of wig-clad girls at feisanna, padded their butts for softball tournaments, and a myriad of other occasions. One goes, we all go. Now, as they got older and schedules became tighter, that wasn’t always feasible, and the reality is that sometimes we can’t all go. And that’s ok. Policies are meant to grow and adapt with the family, and there’s nothing wrong with that. But when we can all be there, we are. My family also approached my disability as a team, stepping up to help fetch and carry, take on extra chores, whatever they needed to do to help me stay involved, but not cause problems for myself physically. Asking for help is not my forte, but I’m getting better at it, and it seems to be working. So now we have a new situation, and it’s time for the team to flip the rally caps over and pull together. I used to joke about the Scientist’s penchant for sweet tea consumption (by the gallon!) was going to turn him into a diabetic. About 6 months ago, I suddenly realized that I was no longer joking. I was worried. He was having actual symptoms, and I was watching them add up to danger. As is the way of men (but never women, no! ), he ignored me. I made mention a few more times, but the fact is, I’m not his mother. I’m his best friend. Well something finally got through, and he went online to read the symptom list and it tweaked him right the hell out. A doctor’s appointment and a vampire’s 3 course meal later, we had our answer: Type II Diabetes. He is, of course, absolutely on board with managing things correctly. He had preferred his little Egyptian vacation, but he isn’t stupid. He is quite cognizant of the deadly properties of this insidious disease, and he has no desire to check out any time soon. And really, if a patient does make the commitment to managing their diet/exercise/levels, it will never get to the point of messing with insulin injections or hideous infections and losing toes. There is no need for it ever to go there with a bit of due diligence and support. We’ve got 4 diabetic cookbooks arriving in the mail on Monday, which will provide a huge help to us, I’m sure. I’m having the kids peruse them as well, because when I overhauled the pantry and fridge, my plan was to overhaul all of our diets. Now, I do not want the kids messing around with food chemicals, so they will not use sugar substitutes much. But I didn’t want this to isolate the Scientist, where he eats his special diet meal over here, and we eat some decadent food right in front of him. That’s just not acceptable to me. So we’re going to eat healthier as a team, and support him as a team. The kids felt a little bit of a disconnect with the whole thing, so I bought the wristbands (kinda like the LiveStrong ones) in red that say “Cure Diabetes” on them. They are quite stoked to wear them in support of their Dad, and I bought extra in case any of our Village wants one, or if one breaks or something. He’s got a profile on Spark Pages, which I think is a cool idea, along with a blog, which will be great for him, too. I’m really glad he’s got the support from his friends; receiving a medical bitchslap, which I have done 4 times in my life, can be truly devastating, and the more support you have, the better off you are in handling it. 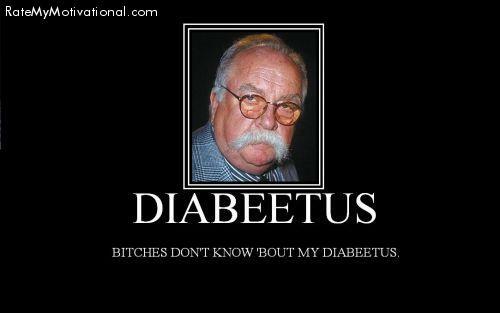 So it’s his turn at bat…time to knock the Diabeetus out of the park.